In Nazi Germany, telling jokes about Hitler could get you killed Hitler and Göring are standing on top of the Berlin radio tower. Hitler says he wants to do something to put a smile on the Berliners’ faces. Göring says, “Why don’t you jump?” When a woman told this joke in Germany in 1943, she was arrested by the Nazis and sentenced to death by guillotine—it didn’t matter that her husband was a good German soldier who died in battle. In this groundbreaking work of history, Rudolph Herzog takes up such stories to show how widespread humor was during the Third Reich. 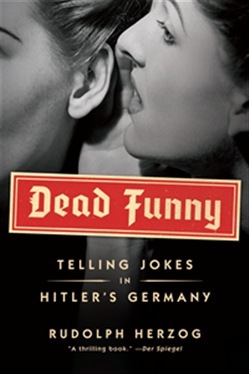 It’s a fascinating and frightening history: from the suppression of the anti-Nazi cabaret scene of the 1930s, to jokes made at the expense of the Nazis during WWII, to the collections of “whispered jokes” that were published in the immediate aftermath of the war. Herzog argues that jokes provide a hitherto missing chapter of WWII history. The jokes show that not all Germans were hypnotized by Nazi propaganda, and, in taking on subjects like Nazi concentration camps, they record a public acutely aware of the horrors of the regime. Thus Dead Funny is a tale of terrible silence and cowardice, but also of occasional and inspiring bravery. Acquista Dead Funny in Epub: dopo aver letto l’ebook Dead Funny di Rudolph Herzog ti invitiamo a lasciarci una Recensione qui sotto: sarà utile agli utenti che non abbiano ancora letto questo libro e che vogliano avere delle opinioni altrui. L’opinione su di un libro è molto soggettiva e per questo leggere eventuali recensioni negative non ci dovrà frenare dall’acquisto, anzi dovrà spingerci ad acquistare il libro in fretta per poter dire la nostra ed eventualmente smentire quanto commentato da altri, contribuendo ad arricchire più possibile i commenti e dare sempre più spunti di confronto al pubblico online.